Drains are the most important part of any flat roof. The sad part is, most of them are poorly positioned and are not 100% effective. We serve Pittsburgh, Stamford, White Plains and all of PA, CT and NY. Often we see drains that are higher than the rest of the roof. This makes water pool over the flat roof area. When a drain is at the same level as a roof surface or slightly higher, debris will collect and cause the membrane to prematurely fail. Pooling dirt water has a tendency to separate seams on a rubber membrane. It is always the best policy to prevent pooling water. The less water pooling on a roof, the less likely it will leak. There several types of drain systems for a commercial roof. Inner Drains – these drain to the inside of the building and are not exposed to cold temperatures during winter. This video above is about replacing a drain on a flat roof. This could be done on any Commercial roof. Outside Drains – these are drains that have the pipes attached to the outer walls of the building. These have a tendency to freeze during the winter and not let the water run off the roof. Scuppers – these are the openings or areas on the side of the roof draining off water. These are very effective since water will flow freely over the edge of the roof in a dedicated controlled area. Gutters – these are mostly found on metal roofs. A commercial roof can incorporate all four types of drainage systems. Generally most roof drains are poorly designed. Although drains are the most important part of a roof, very little thought is put into their location and design. Roof must slope toward drain area. Drain and pipe must be large enough for the volume of water. Strainer must keep debris from clogging the drain. Placement of the drain is important. A flat roof doesn’t necessary have to have a positive pitch. It is important that the drain be placed close to the lowest point on the roof. One way to determine the low part of the roof is to string a line across the surface. This will show where water might be pooling. A laser leveler can also be used. There is far too much water on this roof in the picture, which puts too much stress on the structure. What is amazing is that this is a Modified Bitumen membrane and it has been like this for over 15 years. Now that is proof that water can pool on a roof without causing too much harm. No roof is 100% flat. There will always be some pooling of water on many areas on the roof. The best thing to do is to place a drain in those areas where the water is pooling. Roof Drains – watch video below for the best drainage system. A roofing contractor installs drains according to the blue print he is given. Architects and engineers have failed to provide good specifications on where and how drains should be installed. That’s why you will see pooling water and roof failures many times. The best drain system is recessed into the substrate. Besides recessing the drain, this also provides an area where debris can be trapped. Provide a big enough drain grate and the combination is a very well thought of drain system. In this video we explain how a good drain system is suppose to work. This drain was recessed and a big square area provides for the collection of debris. We kept the old cast iron grate in place. 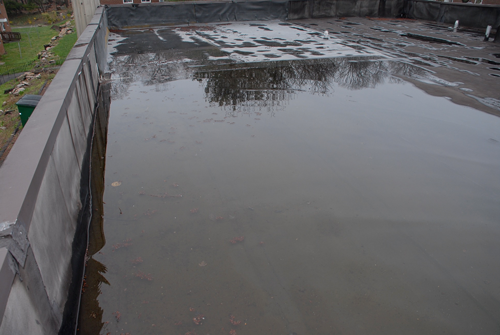 Although the roof is relatively flat, most of the water flows to the drain area. The video above is a good example of how to design a good drain system. The most important feature of a drain is to be able to drain water off a roof even if there is debris collecting around the grate or strainer. That’s why it is a good idea to make an area around the drain that will collect debris while the water can still flow out. The picture below shows a drain in the proper location, the lowest part of the roof. The problem is, debris is still preventing water from draining off the roof. This is why it is important to lower the area around the drain so it will collect debris and allow water to drain off. Below is another image of a drain that has a recessed area around it. 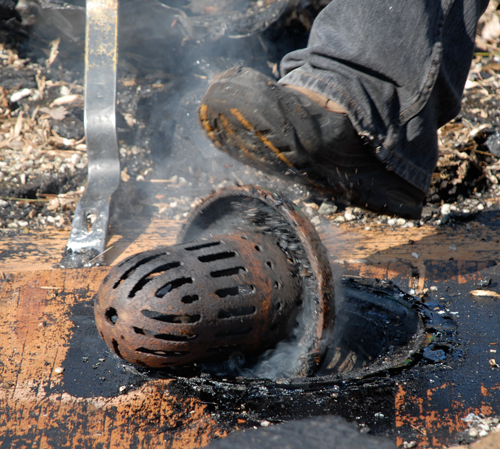 It is critical that the holes or slots be large enough to let small leaves and debris through the grate or strainer. This is important because too small holes will quickly clog the strainer making it ineffective. The image below shows what happens if a drain is not properly flowing. The pitch of the roof is towards the drain. There was no area to catch the debris around the drain and the results are the strainer was clogged and caused water to permanently pool making it possible for plant life to grow. This cast iron strainer is from the 1930’s. The idea was to make a low area around the drain itself. The only problem is, it was to small. Debris would fill that catchment so fast and it was hard to clean it out. The image below shows a typical drain that is installed level with the roof surface. The amount of debris collected around it prevented it from draining. This in turn caused the roof to leak. Plastic strainers like these in the images are not recommended for a commercial flat roof. After a few years they get hard due to the ultraviolets and sun and start to break up. During winter the plastic gets hard and could break easily if someone tries to work around it. The best solution is to replace these strainers with metal ones. The holes and the slots on the strainer below are far too small. This is the worst type of strainer. Small leaves and debris should be able to go through so the strainer does not clog up. This strainer was never effective from day one. This meant the roof constantly pooled up with water due to a bad strainer.